Riedel Sommeliers Syrah / Shiraz / Rhone Wine Glass is shaped to deliver the classic Syrah aromas of toast and black olives. On the palate, the wine glass brings out the wine's silky, velvety structure and balanced flavors. The tannins melt into the fruit, appearing sweet rather than acerbic on the back palate. 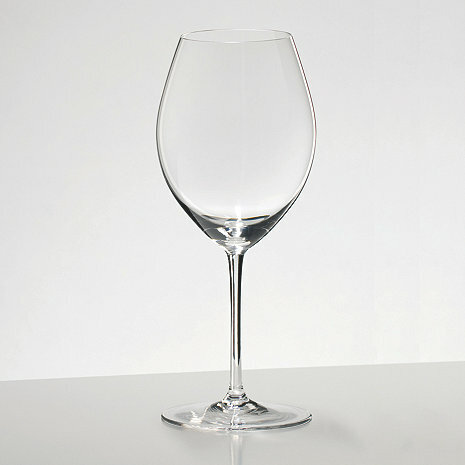 BEST ANSWER: The Riedel Sommerliers Syrah/Shiraz/Rhone Wine Glass (1) is lead free. All Riedel glass is lead free. how do ya tell its a one piece? BEST ANSWER: The Riedel Sommeliers Syrah/Shiraz/Rhone Wine Glass (1) is handmade and is all one piece. Generally, the more expensive the wine glass, the more likely it is handmade which means it's one piece.